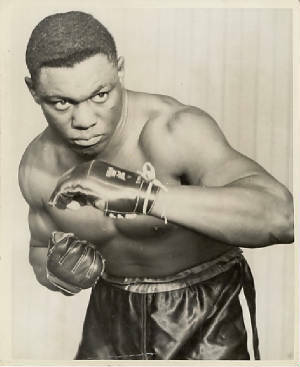 Elmer "Kid Violent" Ray (born October 10, 1910) was an American heavyweight boxer who fought from 1926 to 1949. Ray was known as a hard puncher and had a career record of 86 (with 70 knockouts)-13-1. Ray never fought for the title, but did fight future heavyweight champions Ezzard Charles and Jersey Joe Walcott. In three fights with Walcott, Ray suffered a three round knockout on September 25, 1937, rebounded to outpoint Walcott on November 15, 1946, and lost the third fight by decision (April 3, 1947). He defeated Charles on a split decision on July 25, 1947, but was knocked out in the 9th round of their rematch on May 7, 1948. He also boxed light heavyweight champion John Henry Lewis, but was stopped in the 12th round on May 19, 1938. In 2003, Ray made the Ring Magazine's list of 100 greatest punchers of all time at number 44. He was a World Class National Contender. He is to be inducted into the Florida Boxing Hall of Fame in June 2010. If you you know of anything on him or his family please let me know. Thanks JB. As an editor of a website dedicated to boxing history, I am searching for information on Elmer Ray - an African American heavyweight boxer of the 1930s and 1940s who at one time was the number 1 contender for the title held by Joe Louis. Despite his prominent place in boxing circles, not much of his background is known: neither when he was born, nor what became of him after his boxing career had ended. Recent research however has uncovered that he was born around 1912/1913 to John A. Ray and Lillie Ray who owned a potato farm in Federal Point, Fla. and that he had brothers named William, Robert and Lincoln and sisters named Louisa, Margaret, Carrie and Julia. By 1945 the household of John and Lillie Ray consisted solely of Mr. and Mrs. Ray and a 7-year old named Earnestine Ray who might have been a grandchild. As I came across the website dedicated to Federal Point history, I was hoping you might have more information on Elmer Ray or on any relatives of his that are still alive. His relatives might also be interested to know that Mr. Ray is being inducted into the Florida Boxing Hall of Fame in June of this year. I hope you can help me out or have an idea who I should turn to with my request. Your help is very much appreciated. Elmer Ray - who started his career as 'Bearcat Ray' - indeed became widely known as Elmer 'Violent' Ray. This 'Violent Ray' monicker may have started out as 'Violet Ray', though, as some earlier reports list him as such. Regarding his early career not much is known of him until he came to Miami in 1935. Chances are that he had previously fought on 'colored boxing programs' that generally received little attention from 'white' newspapers. It is also believed that he engaged in many 'battle royals' before coming into prominence - these were fights in which a number of black fighters were put in the ring and the last one standing was declared the winner. Well into the 30s, 'white' boxing programs in the South featured battle royals as their opening event. Although becoming the number 1 contender for the heavyweight title, beating two future champions and at one point having a winning streak of 50 fights, Elmer Ray would never receive a title shot during his career. This may be explained by the fact that Ray peaked during a time that heavyweight champion Joe Louis was in the Army and also that it was a time in which public demand for a title fight between two black heavyweights was not very big. At the end of his career Ray would eventually fight Joe Louis in a number of exhibition fights in Florida (fought with big gloves, where no winner was announced and the title was not on the line), but that was as close as Ray came to fighting for the heavyweight title of the world. Soon after Elmer Ray - already around 37 at this time - suffered a number of losses and quit boxing. By the time of his retirement in 1949 Elmer Ray was no longer living in Floridia but was based in Minneapolis. He may have moved to California eventually as his former manager Tom O'Loughlin once said, but (until now) no-one in California boxing circles has found any further evidence of him coming to live there. I noticed that the information you provided on his brothers and sisters lists earlier dates of birth than U.S. and Florida Census data indicate. As I have no background of genealogical research I don't know whether Census data in general are reliable or that they are prone to misstakes. The discrepancy between the years of birth may be explained by the fact that official records of their births may not have existed: as to Elmer Ray's age, a May 1948 Associated Press wire reported that the day of his birth (and that of his siblings as well) had been carved in a tree by his parents on their farm. And as that tree had burnt down following a forest fire, and no other record of the date had been kept, not even Ray himself knew how old he was. Once more, thank you very much for your help. The link to Elmer Ray's Boxrec page on the Federal Point page does not work. I don't know what exactly the problem is.